Find a place to work where you don’t have to worry about dust, paint drips and a mess. A garage is ideal. 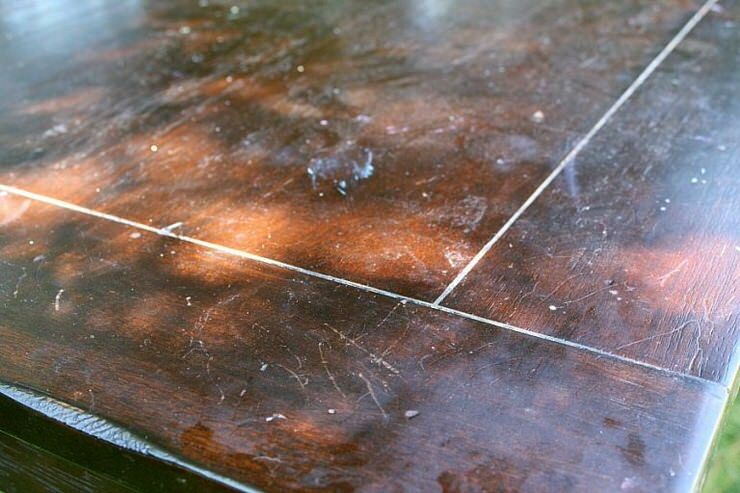 If you have to redo your dining set outside, make sure it is not a windy day to prevent your paint job from being ruined by dust and debris. 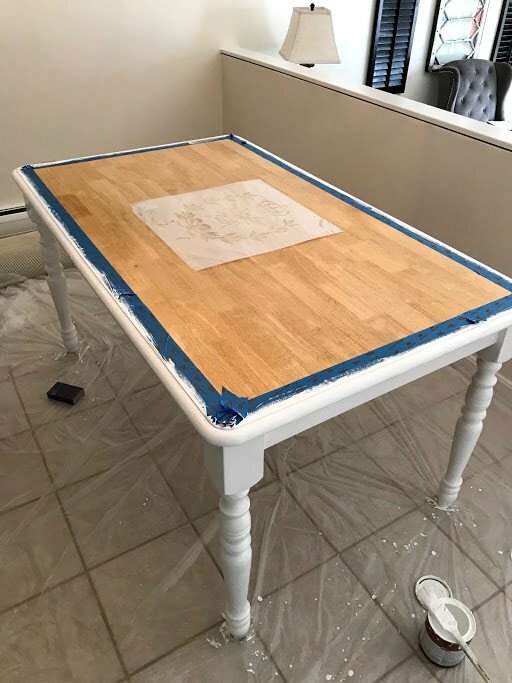 To redo your dining set inside, place a large drop cloth underneath your dining set, then place small squares of wax paper under table and chair legs so you can paint all the way to the floor. Choose a new fabric to recover your dining seats. Go for a newer, modern print in a cool geometric, or a new trendy color. 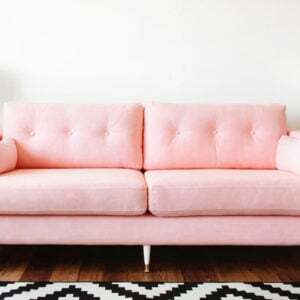 This update alone will help make your furniture seem fresh and new! If your chairs aren’t upholstered, follow the paint directions below. Consider a different color for the chairs! 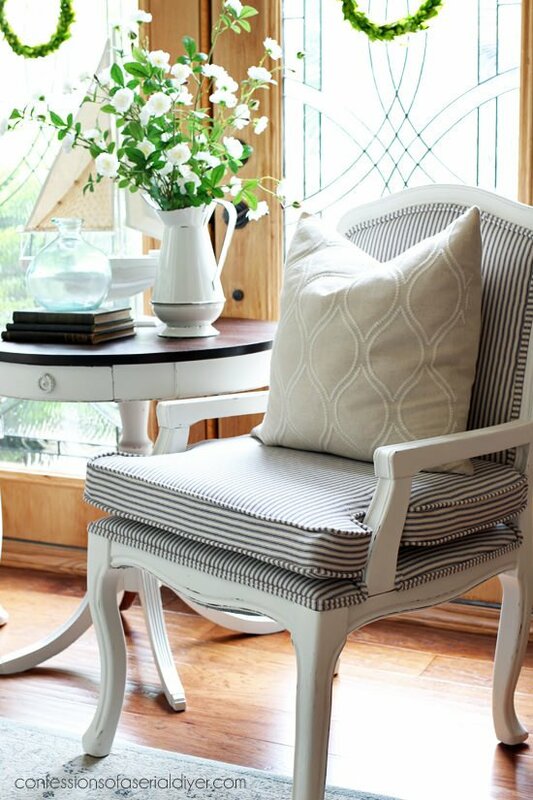 While we are on this step, check out ‘Confessions of a Serial DIYer‘s’ French chair makeover tutorial. 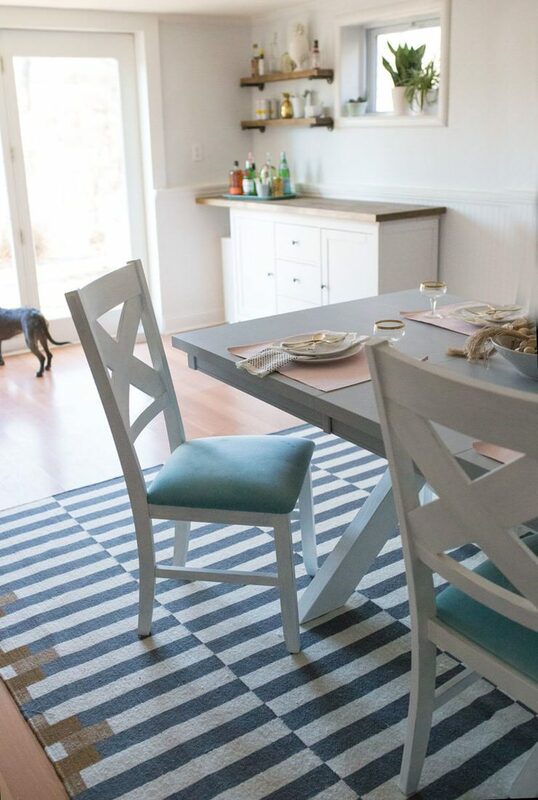 She uses these very chairs in the dining table makeover project farther down in this post. These are awesome! 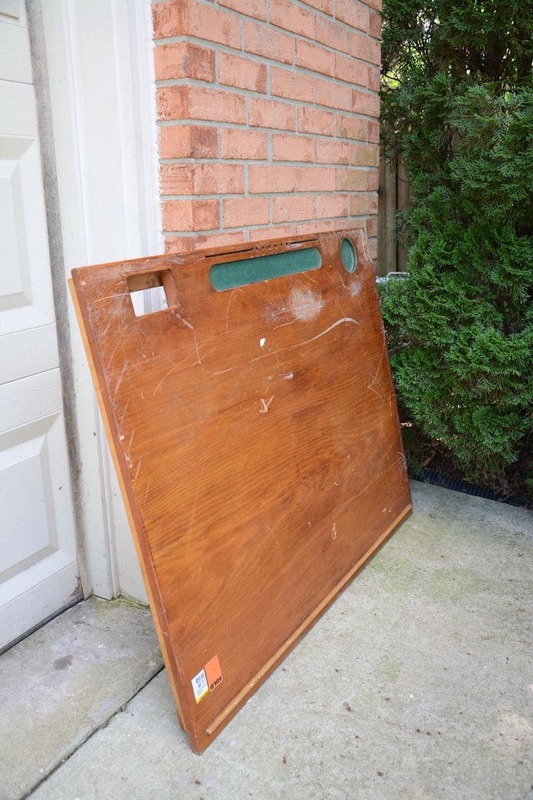 Go check out the “before” photos… you won’t believe it’s the same chair! Sand and prime dining chairs and table. Let dry 24 hours. Paint dining table and chairs with your chosen paint, following manufacturers instructions on the can. You will likely need several coats. Let dry 24 hours. Tip: I like to use a mini foam roller on the tabletop itself… it gives a smoother finish without brush marks. Re-attach chair seats using the same screws or bolts. 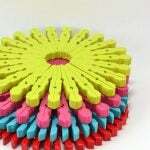 If desired, coat with a water based polyurethane to protect the surface. Remember to choose a clear coat in the same finish as your paint… If you used satin paint, use satin poly. Done! Remember, the key to updating your dining set is to choose fabrics and paint colors that reflect today’s fresher styles. 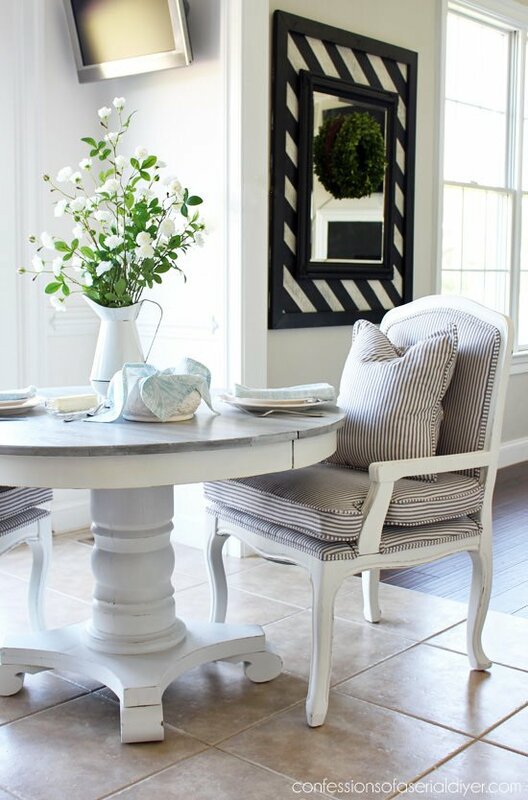 You can update your dining table and chairs on a budget with paint and fabric, and set the tone for your home with a fresh new look. 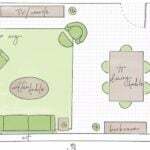 Want to pick a project that’s right for you? Let’s get inspired by these amazing bloggers! 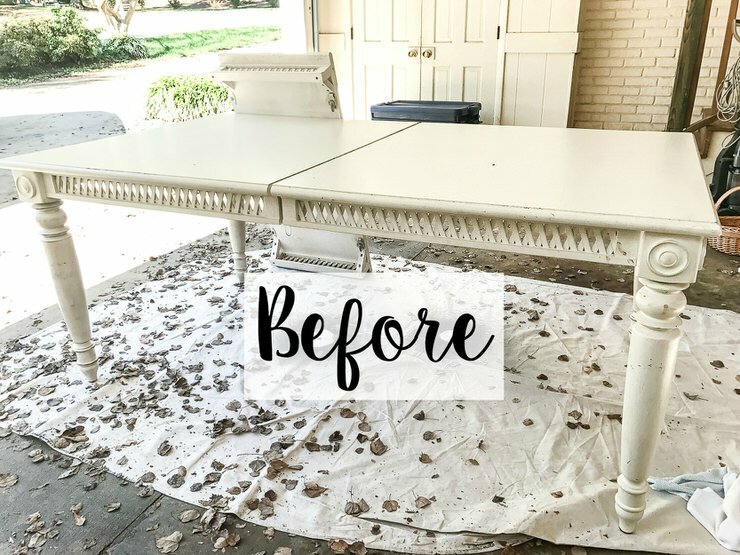 ‘Confessions of a Serial DIYer‘ took an old thrift store table, and turned it into this gorgeous dining table makeover – with paint! And those chairs she paired it with? She reupholstered those herself too. (See above!) Such a pretty dining table! 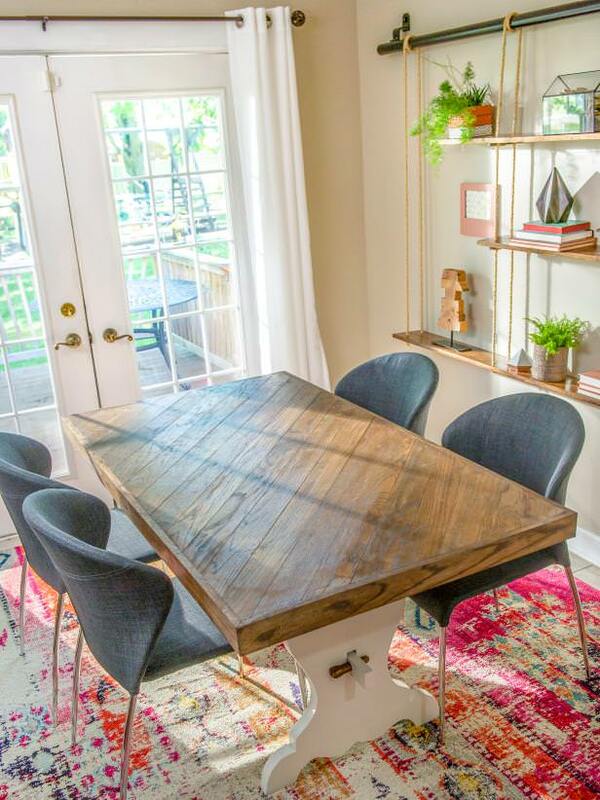 ‘Shrimp Salad Circus‘ walks you through how she did her dining table makeover with chalk paint! This means she didn’t even have to prime first. Curious? She has all the supplies she used listed on her post for you. Such a great before and after! 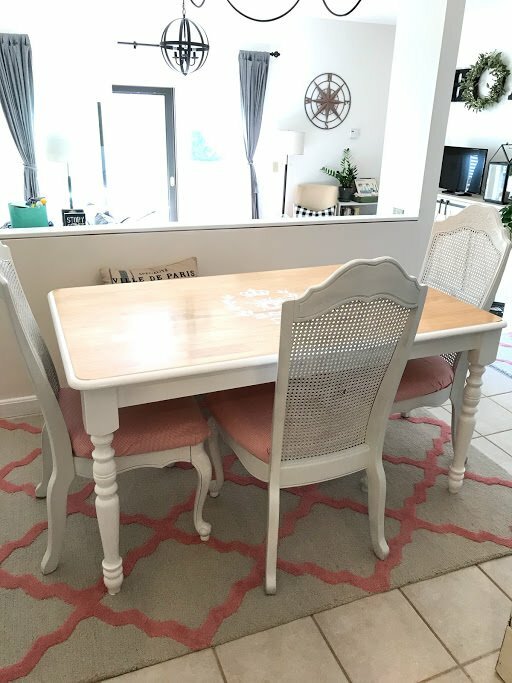 Lauren at ‘Bless’er House‘ found this gorgeous carved wood table on FB marketplace for $100. 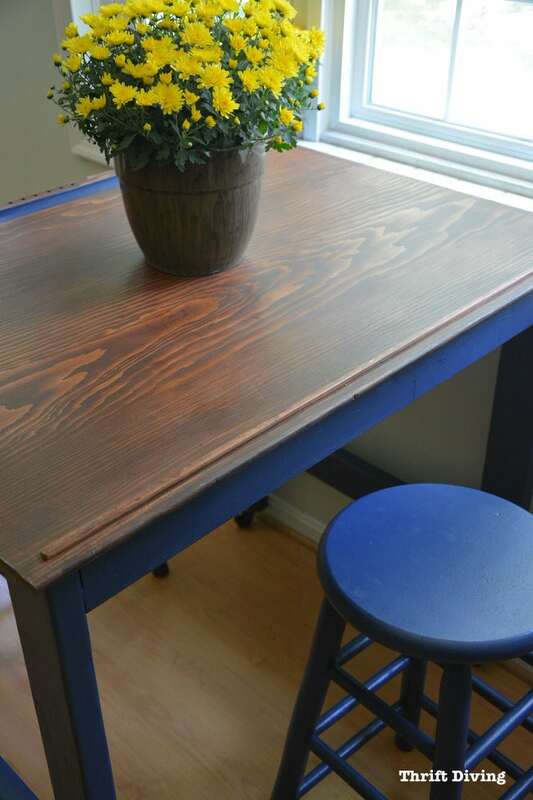 With some paint and stain she created a two tone stunner! Lots of step by step photos in this tutorial. 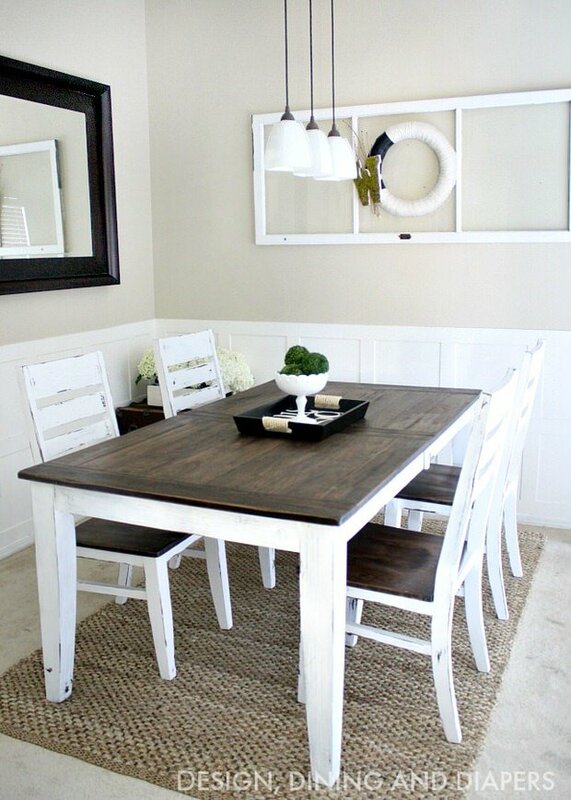 So we like this slightly traditional, but still fresh take on a dining table makeover from ‘Lucy Lemonade‘. 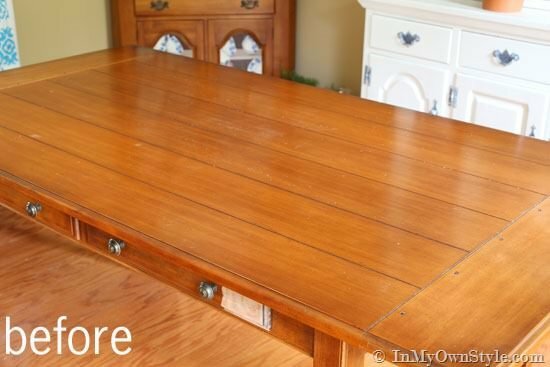 She took a cheap, everyday oak tone table, and turned it into something special with paint and a stencil. 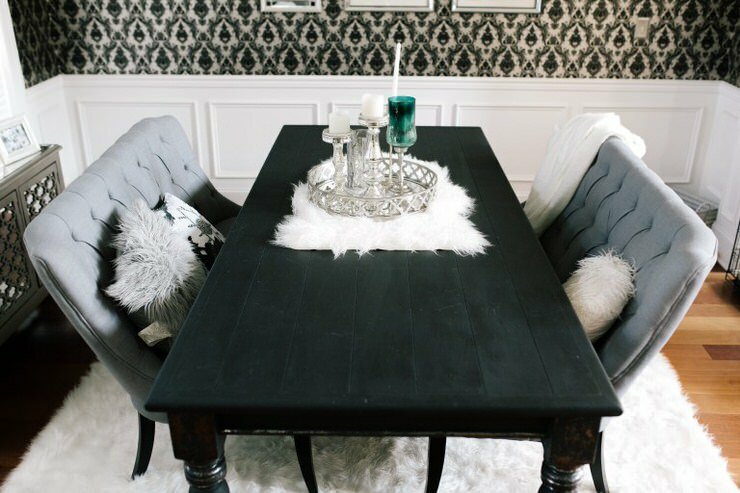 ‘Nashville Wife Styles‘ dining room table makeover start with a dark monster of a table, and ends up with an even darker, cooler than ice cream in January kinda thing! 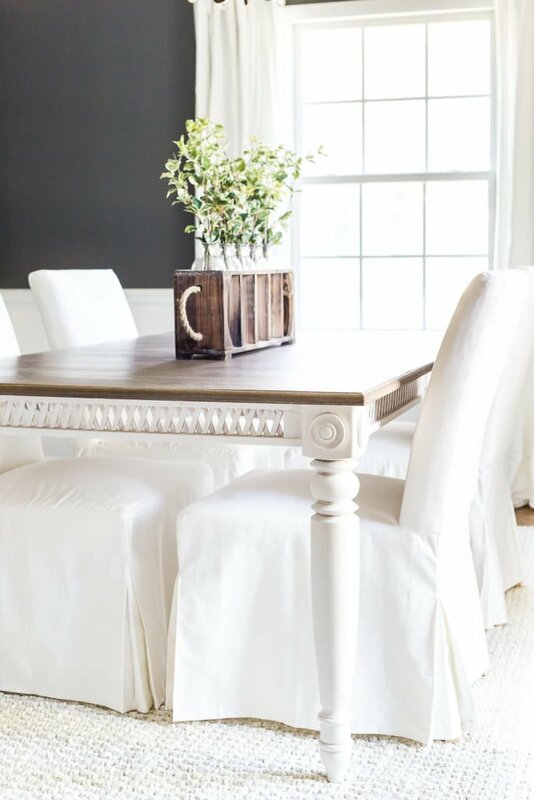 Oh my goodness, this matte black chalk paint gives this table (and the room ) such drama! And she even shows you how to add the foiling accents. Loving this! 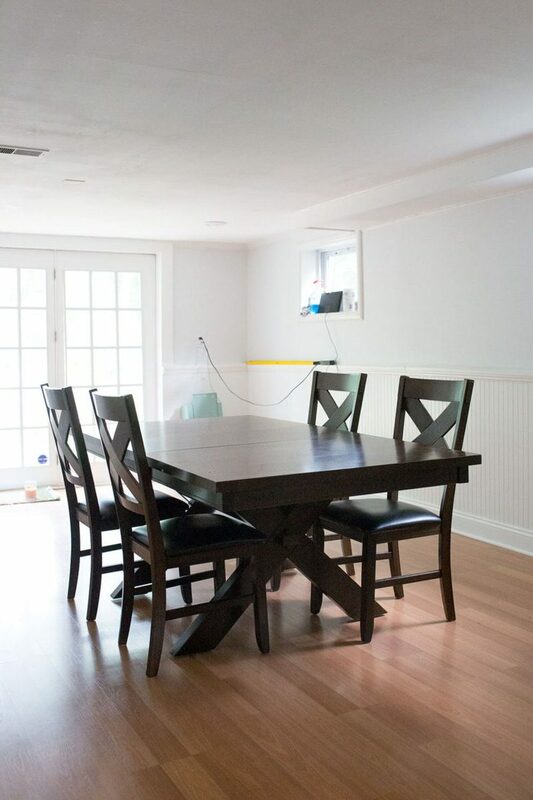 From ‘Thrift Diving‘, this eat in kitchen dining table makeover started out as an old drafting table top. She added some 2×4’s, some paint and some stain… Voila! 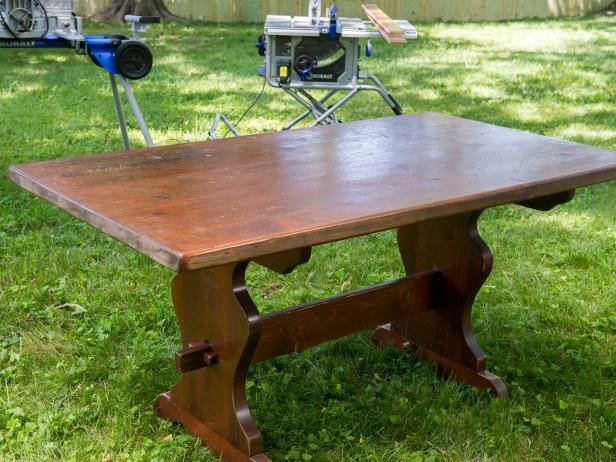 ‘Southern Revivals‘ took her dining table makeover a step farther. 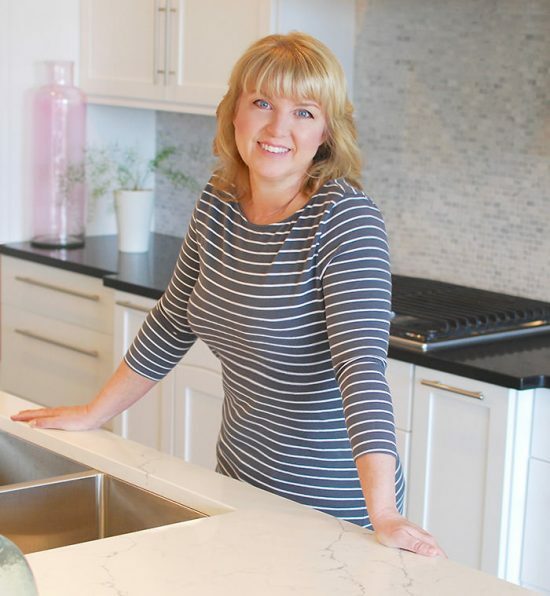 Instead of using paint, she created a parquet wood top where tile used to be. This is a totally different table than it was before! This tutorial is in two parts, so be sure to scroll down to the bottom of her page for part 2. ‘DIY Network‘ also did a dining table makeover with wood. They used wood laminate flooring to redo this ugly, scratched and old piece of furniture. It’s gorgeous now! Check out how they did it! 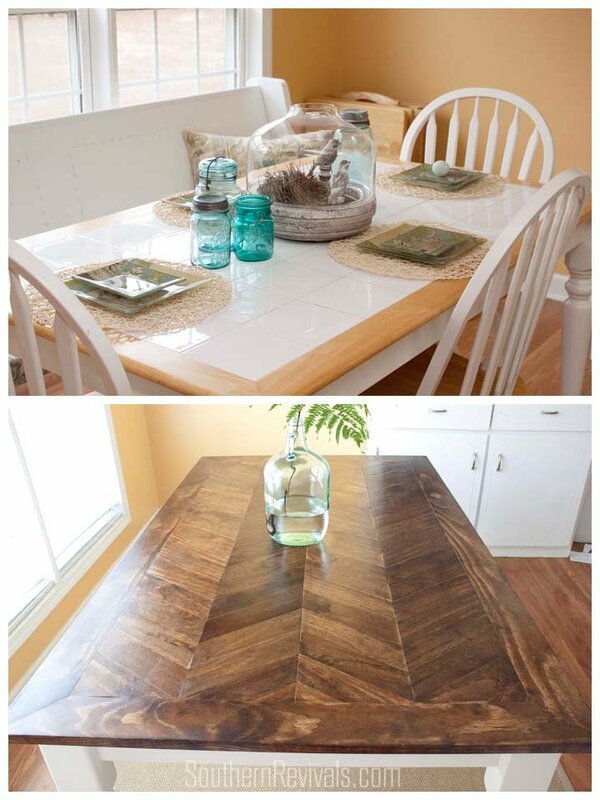 Diane at ‘In My Own Style‘ shows you how to make a driftwood finish when doing a dining table makeover. 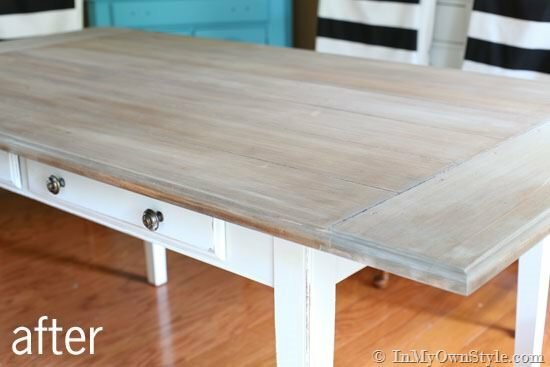 Easy instructions to this cool, updated finish! 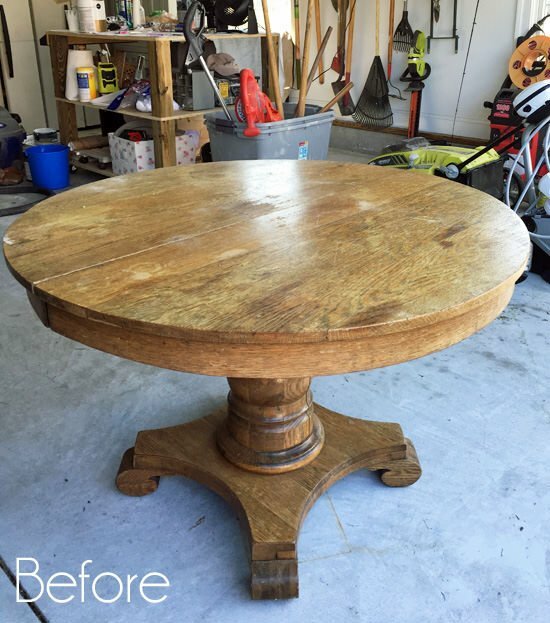 This farmhouse dining table makeover really updates the look… I love the cool and clean look with this project… Beautiful job! From ‘Design, Dining and Diapers‘! 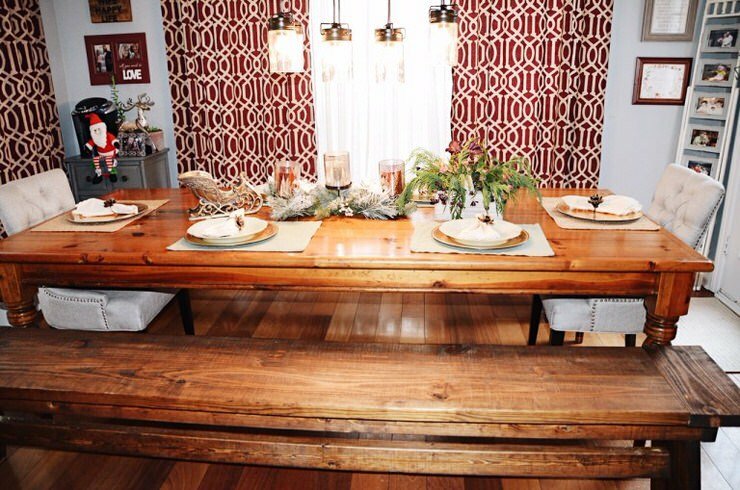 We hope you enjoyed DIY dining table makeovers! We think you will also love our posts on DIY Bathroom Vanities and How to Reupholster Chairs! 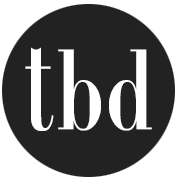 Note : This post has been updated with fresh projects. Love the re-do’s! I was wondering how difficult it would be to make cushioned seats on kitchen chairs that currently do not have cushions – they are just wood-seat, country-style chairs with wood slats on back. I love the idea of a cushioned seat (& so does my bottom! :), but just wondering if you’ve seen it done & if you have any frugal tips on this. Thanks! Love your site! There are several ways to make a cushion for your seats! You could purchase some thin foam from Joanns(be sure to use a coupon!) Cut the for to the desired size and shape. Then to have the raised center get some batting, it’s pretty cheap at Walmart and again cut it to the desired size. Use several layers and hand stitch the layers of batting together. I would then run a quick stitch attaching the batting to the foam, even a spray adhesive would work. You could then uphholster in the same way as shown or to make them removable sew wooden toggles to the back and put them through the wooden spacers on the back of the chair. I hope any of that makes sense and works for you. Good luck on your restyle!